The city has beautiful public art depicting the life and ideals of its residents. 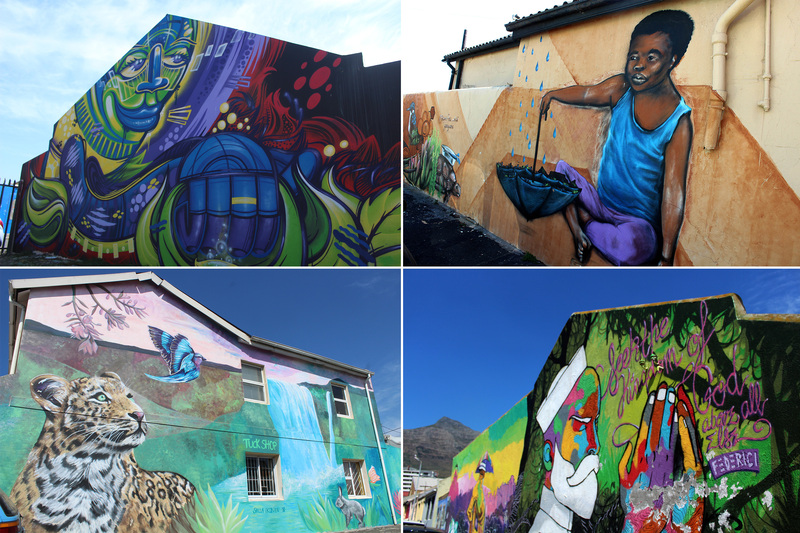 Although the City of Cape Town declared graffiti a public nuisance when it gazetted its Graffiti By-law in 2010 in what many street artists see as an attempt to regulate artistic expression outside of curated galleries, the city is nevertheless graced with world-class murals created by local and international graffiti artists. 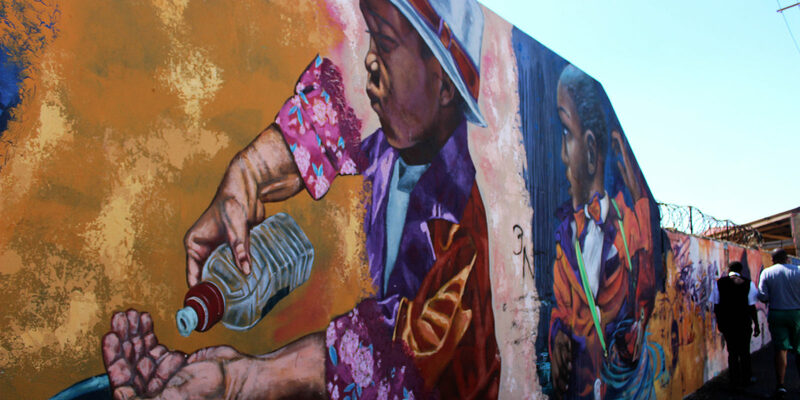 Masixole Feni photographed a few of these iconic murals that have been created with the permission of City authorities. 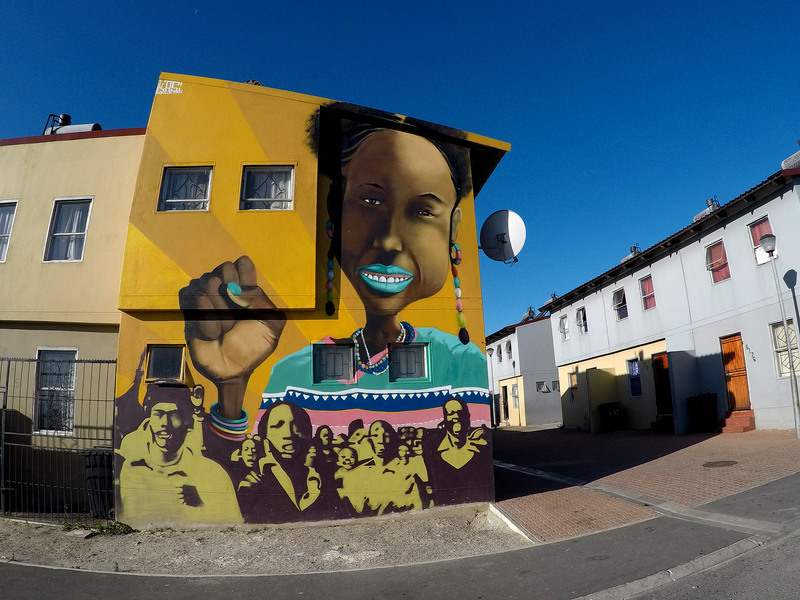 Although unsigned, the different styles contained in this work in Langa reveals the collaboration of two or three artists to commemorate the youth uprising of June 16, 1976, when thousands of schoolchildren confronted the apartheid state in Soweto. The colourful hatching and cross-hatching to create highlights on the child’s face is a signature style of local graffiti artist Skhumbuzo. Inspired by a photograph taken by Ignatius Mokone, an African aesthetic can be seen in the distinctive Lesotho hat, and the headgear worn by the silhouetted figures in the background, as well as the shape of the trees, the sun and moon, and the birds flanking the grouping. 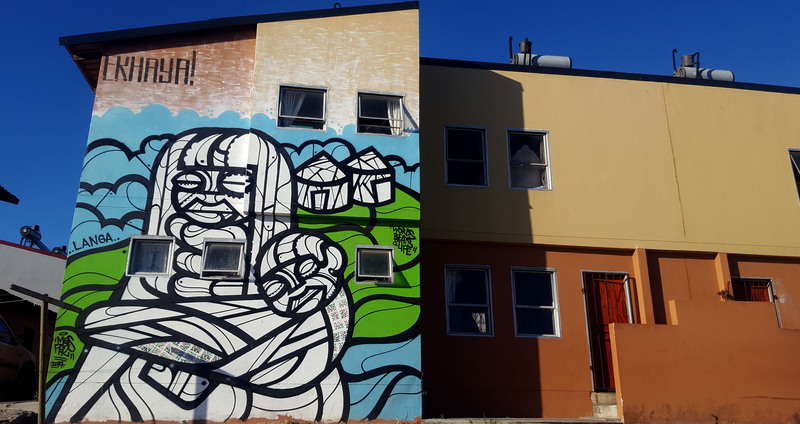 The intricate black and white geometry of Colombian graffiti artist Mas Paz can be seen on this double-storey mural gracing a unit in the N2 Gateway housing project in Langa. His work is often purely abstract yet maintains a sense of organic form. Animals are also a favourite motif and drawn using the same geometric style. Here, in what appears to be an unusual figurative piece, he uses his style to create an African Madonna and child, stencilling his own tag onto the babe’s swaddling to create a pattern. An orphan, Mas Paz says he donates 5% of all his earnings to the La Casa de La Madre y El Nino where he grew up in Bogota. Ekhaya is the word for home in Xhosa. Elements of Afro-punk, a distinctive Johannesburg street style characterised by bold clashing colours and celebrating the multiple possibilities of “African” hair, are evident in the blue lipstick and hairstyle depicted on the main subject. 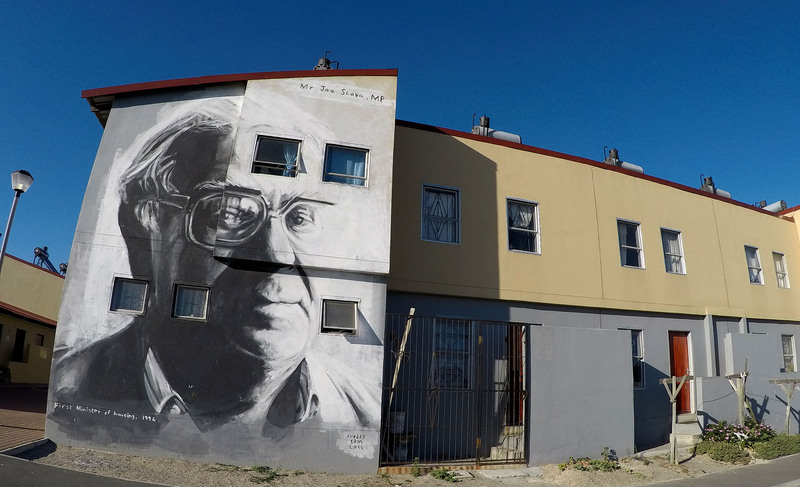 Former South Africa Communist Party General Secretary Joe Slovo looms over the N2 highway from a wall at the N2 Gateway housing project. Painted by Ricky Lee Gordon AKA Freddy Sam, Slovo was a white South African actively involved in the anti-Apartheid struggle and his resistance saw him and other activists charged with treason in 1956. The charges were dropped two years later. Slovo became a leader of the ANC’s armed wing, Umkhonto we Sizwe, and while in exile in Mozambique, his wife, Ruth First, was killed by a letter bomb. 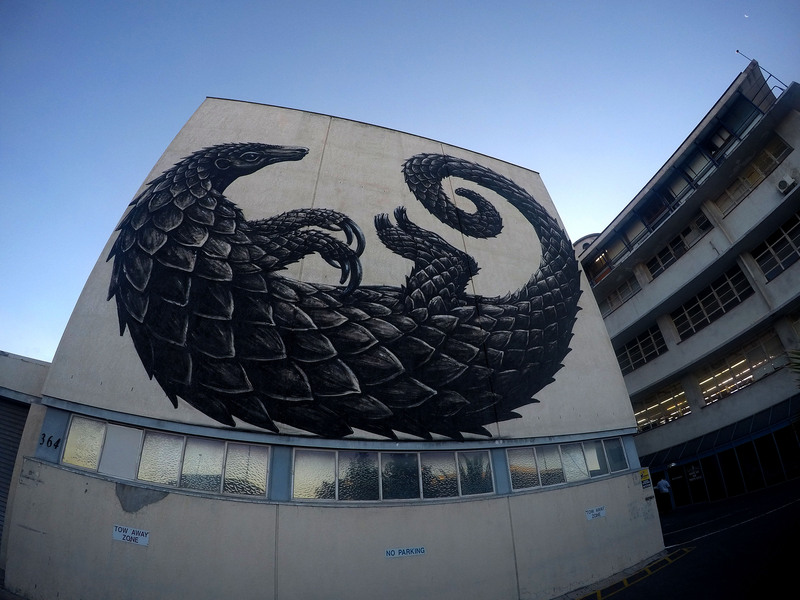 A giant pangolin painted by Belgian artist Rua lies on its back at a textile factory in Salt River. The pangolin is one of the most illegally traded species on the planet. Rua painted it during the annual International Public Art Festival last year in order to highlight the threat to this species. Rua’s animals can be found on walls in cities around the world, bringing attention to the disappearance of natural habitats. 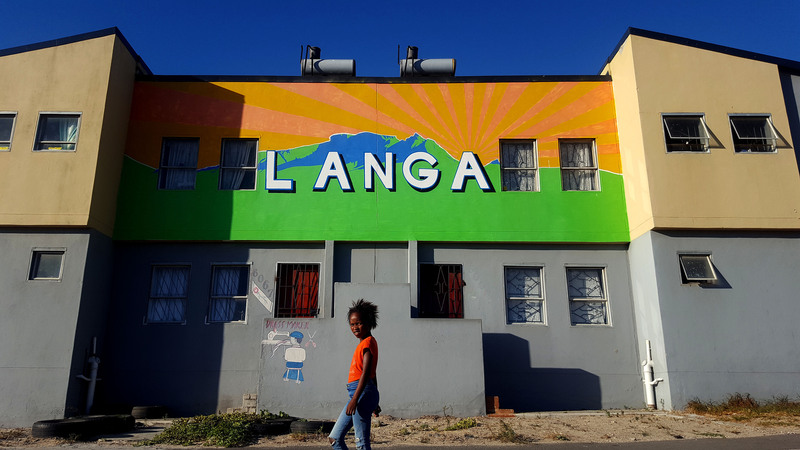 Colourful signage including a detailed rendition of Table Mountain, brightens a wall in the N2 Gateway Housing project in Langa. The work is unsigned and the artist unknown. 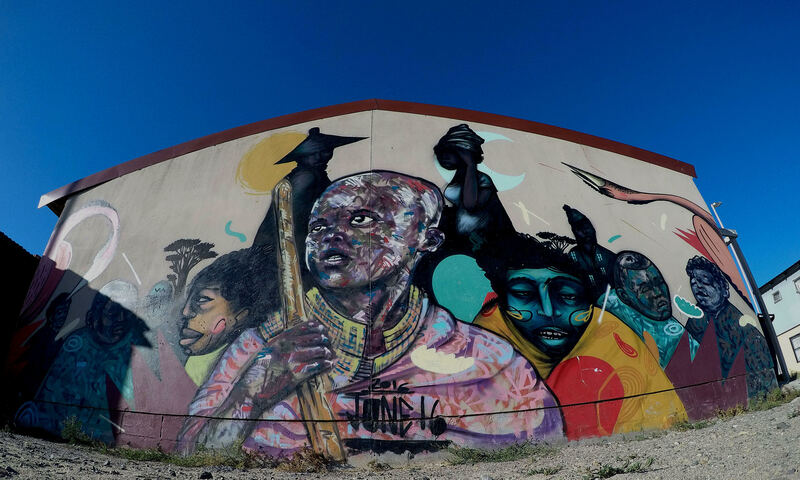 One of Cape Town’s most photographed murals shows “Boniswa” shading her eyes from the sun as she looks across from the Isivivana Centre in Khayelitsha toward Table Mountain in the distance. 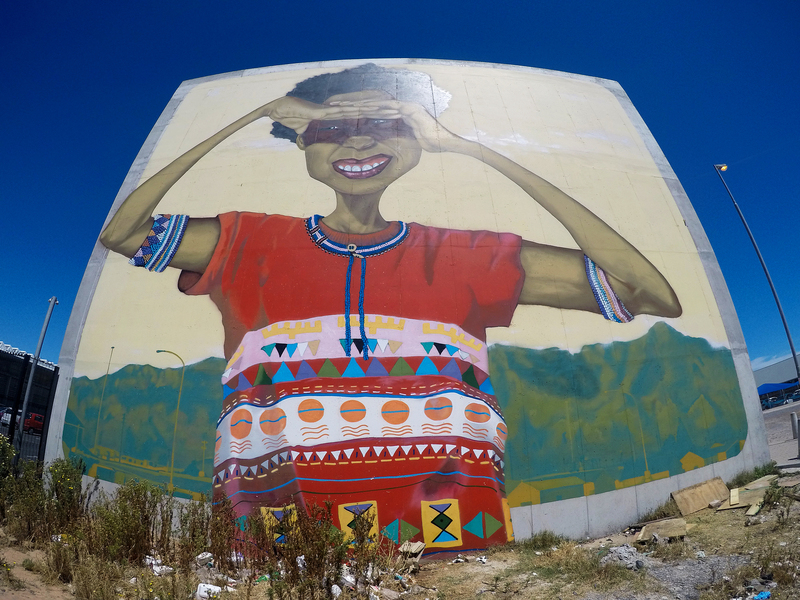 Artist Breeze Yoko, who painted it in 2016, stated on his Instagram account that very few children living in Khayelitsha ever get to walk on the mountain. The work is dedicated to “the black girl child who holds the key and is gifted with the vision of the future”. 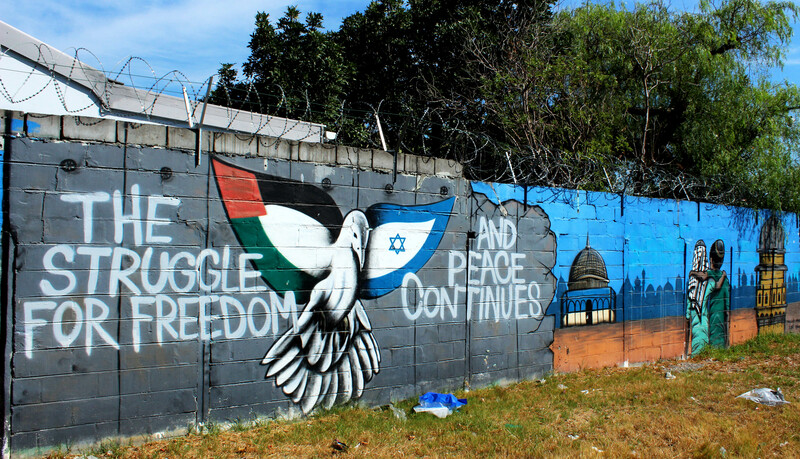 This mural in support of freedom and peace in Israel and Palestine overlooks an open field next to a bridge near Red Cross Hospital in Rondebosch. We could not identify the artist.